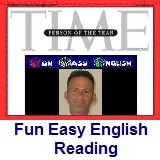 ﻿ Fun Easy English - reading practice and learning about the holiday Black Friday. Black Friday is the Friday following Thanksgiving Day in the United States, often regarded as the beginning of the Christmas shopping season. In recent years, most major retailers have opened extremely early and offered promotional sales to kick off the holiday shopping season, similar to Boxing Day sales in many Commonwealth Nations. Black Friday is not a federal holiday, but California and some other states observe "The Day After Thanksgiving" as a holiday for state government employees, sometimes in lieu of another federal holiday such as Columbus Day. Many non-retail employees and schools have both Thanksgiving and the day after off, followed by a weekend, thereby increasing the number of potential shoppers. It has routinely been the busiest shopping day of the year since 2005, although news reports, which at that time were inaccurate, have described it as the busiest shopping day of the year for a much longer period of time. The day's name originated in Philadelphia, where it originally was used to describe the heavy and disruptive pedestrian and vehicle traffic which would occur on the day after Thanksgiving. Use of the term started before 1961 and began to see broader use outside Philadelphia around 1975. Later an alternative explanation was made: that retailers traditionally operated at a financial loss from January through November, and "Black Friday" indicates the point at which retailers begin to turn a profit, or "in the black". For large retail chains like Walmart, their net income is positive starting from January 1, and Black Friday can boost their year to date net profit from $14 billion to $19 billion. For many years, it was common for retailers to open at 6:00 a.m., but in the late 2000's many had crept to 5:00 or even 4:00. This was taken to a new extreme in 2011, when several retailers (including Target, Kohl's, Macy's, Best Buy, and Bealls) opened at midnight for the first time. In 2012, Walmart and several other retailers announced that they would open most of their stores at 8:00 p.m. on Thanksgiving Day (except in states where opening on Thanksgiving is prohibited due to blue laws, such as Massachusetts where they still opened around midnight), prompting calls for a walkout among some workers. Black Friday shopping is known for attracting aggressive crowds, with annual reports of assaults, shootings, and throngs of people trampling on other shoppers in an attempt to get the best deal on a product before supplies run out. Let the craziness begin. This is certainly the best day of the year to STAY HOME, at least in America. Sure you can get some pretty good deals on a lot of things but is it worth it? Crowded streets not to mention stores packed with bitchy people trying to save a few bucks. All this the day after a relaxing Thanksgiving. 1. When is Black Friday? 2. Black Friday is which of the following? 3. The name “Black Friday” originated in which city? 4. Black Friday has routinely been which of the following? 5. Black Friday typically has annual reports of all EXCEPT which of the following?